DevTalkLA, that Geeky Book Club started a new one last night. Pictured above, we began discussing About Face. This is the new 4th edition of a "classic" which has been around for two decades. This latest release came on September 2nd, and includes mobile devices! Mobile is crucial for user experience! So this promises to be a very important book. TheHackerCIO doesn't specifically focus on User Experience (U/X) as a sole pursuit. But he has to wear every hat in the wardrobe, so adding in knowledge about U/X and IxD (Interactive Experience Design) is a welcome addition. It adds to the arsenal. We had a lot of new blood at the Meetup. 24 people RSVPed, but of course only 12 showed, making for a 50% Unreliability Factor. It's always good to note how flaky, irresponsible, undependable and unreliable people are. It's an important index for life. In this case, 50% of respondents actually had the politeness and follow-through to keep their commitment. TheHackerCIO follows this principle, "Always call out bad behavior." You don't want that to go unremarked upon. Ideally you'd like to see it go away. Following through on your RSVP allows a Meetup organizer to get a room of the correct size. If all 24 had showed, we would have needed the larger room. It also allows the organizer to get food or refreshments for the Meetup. I mention this just to indicate that RSVPs have a *reason*. And it's only common courtesy to RSVP if you're going and stick to it. With over 50% of attendees being first-timers, the Fearless Leader spent a good deal of time giving everyone an overview of DevTalkLA: how we've been continuously discussing technology books for 15 years or more, how we select the books (by vote), and the "bidding" system we use to determine who goes next on offering a comment/question/problem or issue to discuss. As usual, the discussion was wonderful. I hope we see these newcomers return next week! We began discussing the introductions, with the interesting point that designing behavior is a totally new concept. Products have been designed, but in a very static sense. The form of a product has been designed. Even the content has been designed. But with computer technology, we now have an additional element of behavior to consider and design. We were greatly missing one of our old-timers for this book. He has to sit it out for personal reasons. He was always such a helpful addition to the group because he came it with Post-It-Tabs showing clearly every next comment he would raise, and in the absence of others having read the book, we could depend on him to drive the discussion. Since this book was a new release, I made sure that I did a similarly thorough job, so that we would have a very full and helpful discussion for the kick-off session. On page xxii and following: I noted that there was some confusion. First they questioned whether an experience could be designed. 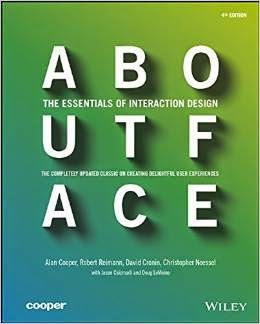 So instead the book authors "have choosen Moggridges's term 'interaction design' to denote the kind of design this book describes." This statement in isolation isn't confusing, but the following paragraph stated that "we feel the term *user experience design* is most applicable." So the question is, WTF? Is this book going to use the term "interaction design" or "user experience design," or both? If they are using both, when will they be employed and why the need for both term? It's not crucially important, but it raised issues for me, and no-one else was able to offer any insight.